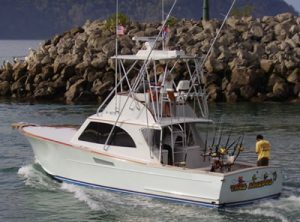 This 38ft Cold-Molded Custom Sportfisher powered by twin Cummins 370B diesels fishes out of Los Sueños Maria in Playa Herradura. Built in 2005, with captain Greg Giampapa at the helm, she has 98-mile 25KW radar to find the birds, a/c cockpit and cabin, head and shower, release marine fighting chair, live well and large fish box. Equipment includes Shimano reels, TLD30 Rupp outriggers electric teaser reels, Tiagra 50, 80 and 130s, and Shimano and Cape Fear rods, along with two VHF radios and digital depth sounder.